The Friends of the Missouri Breaks Monument will be at Snow Hop on February 20th from 5-8pm for Local Wednesday. 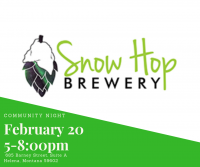 For every beer sold, Snow Hop will donate $0.75 to our organization. Friends of the Missouri Breaks Monument is a local 501(c)3 nonprofit focused on protecting and preserving the Upper Missouri River Breaks National Monument.